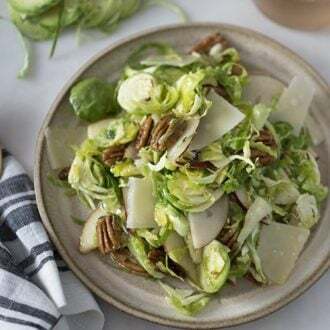 This delicious brussel sprout salad pairs crunchy mustardy shaved brussel sprouts with toasted pecans, sweet and tender pears, flavorful parmesan and a zingy tumeric vinaigrette infused with fresh thyme! Are brussel sprouts good raw? We all know Brussels sprouts are delicious when roasted (I’ve eaten entire pans of them) but they’re just as great raw! 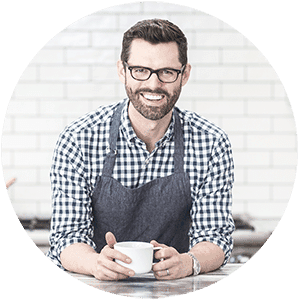 They’re quite substantial so you can really go big with your dressing and other components. The key is to slice the sprouts thinly so each bite can have a nice mix of flavors. I will warn that for some people eating raw cruciferous vegetables like brussel sprouts and cabbage causes gassiness. 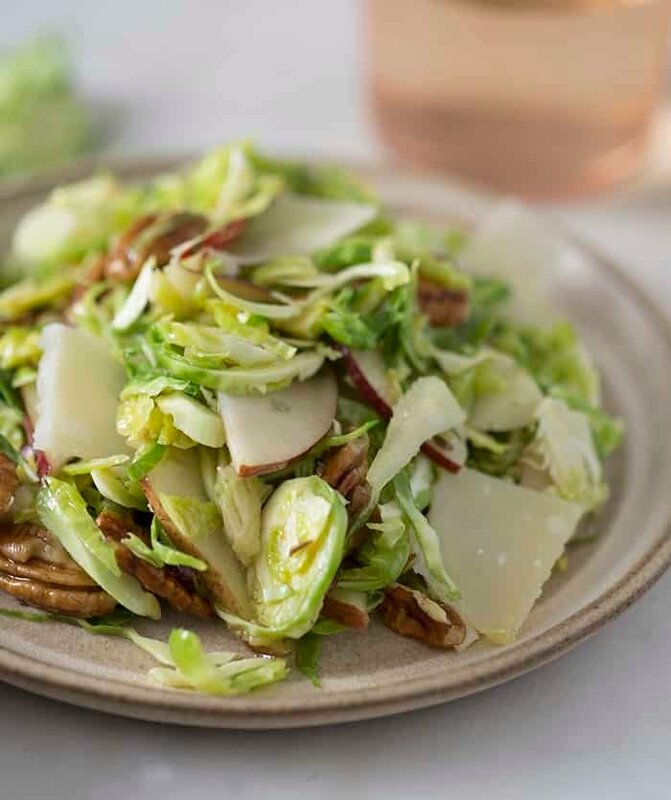 To do this salad ahead make the dressing, prep the brussel sprouts, toast the pecans, add shaved parmesan to a plastic bag. Slice the pears before and toss together before serving. Dried cranberries will add a burst of sweetness and pop of color! I used apple cider vinegar but white wine or champagne vinegars will work as well. Crumbled goat cheese or pecorino Romano are nice substitutions for parmesan. 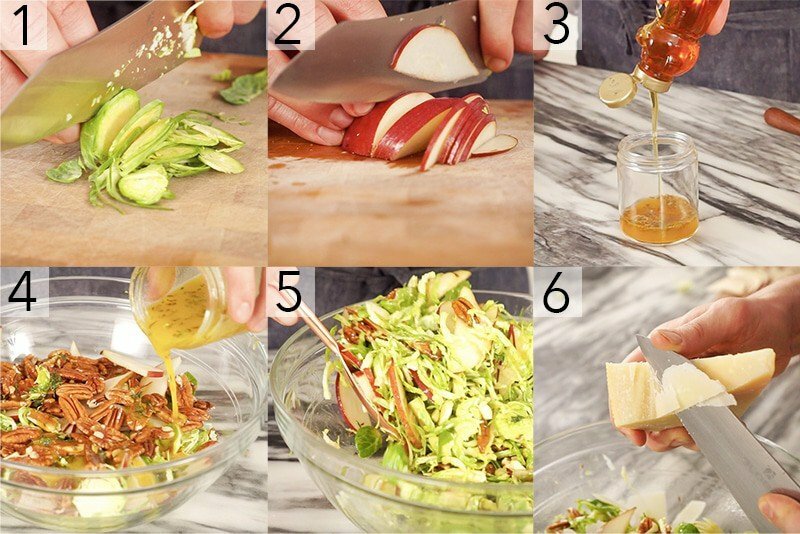 How do you make brussel sprout salad? For the salad; chop your brussel sprouts into very thin slices. The thinner the better. (Be careful and use your knuckles as a guard when you cut). Cut the core off of your pears and slice them into very thin slices. For the dressing; add all of the ingredients into a small jar. Make sure to crush up the thyme to get the flavor out. Close up the jar and give it a shake or a good mix. For the assembly; toss all of your salad ingredients together in a large bowl and pour the dressing on top. Make sure you give your salad a good toss before you add your parmesan, making sure everything is coated evenly. Now that your salad is tossed, you can carefully shave in as much parmesan as you’d like. If you’ve tried this salad then don’t forget to rate the recipe and let me know how you got on in the comments below, I love hearing from you! 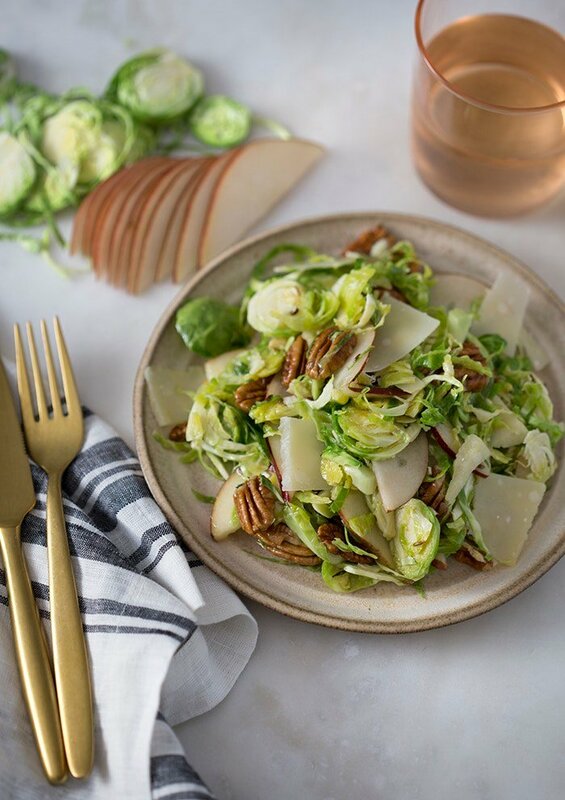 This crunchy super-flavorful brussel sprout salad features beautifully sweet pear slices, toasted pecans, and shaved parmesan, all coated in a zingy turmeric dressing infused with fresh thyme. Chop your brussel sprouts into very thin slices. The thinner the better. (Be careful and use your knuckles as a guard when you cut). Cut away from the core of your pears. Cut the pears into thin slices. Add all of the ingredients into a small jar. Make sure to crush up the thyme to get the flavor out. Close up the jar and give it a shake or a good mix. Toss all of your salad ingredients together in a large bowl. Dress the salad and give it a toss. Shave in as much parmesan as you’d like. 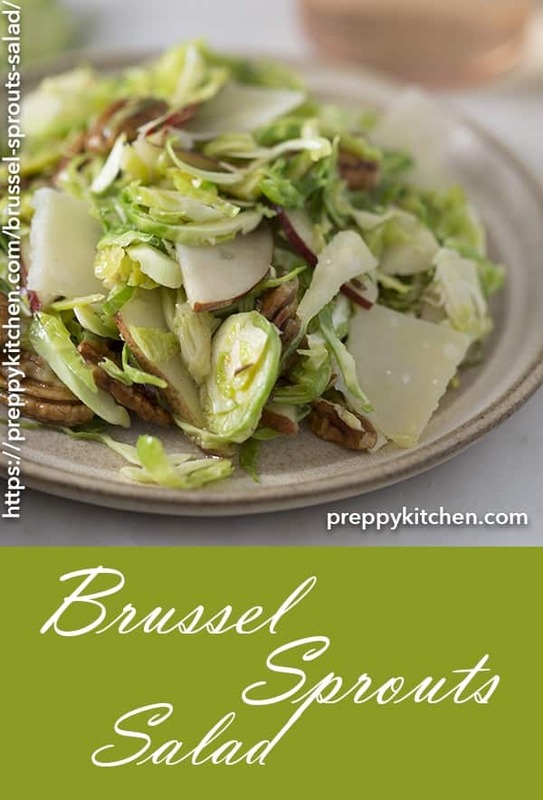 Ive been looking for a great brussel sprout salad and this looks amazing! John, you’re the best!